This is a great portable water filter for camping, hiking, or a Doomsday Survival situation and will easily fit in your Bug Out bag without taking up too much space. The Sawyer Mini will filter up to 100,000 gallons (30 times more than comparable filters). 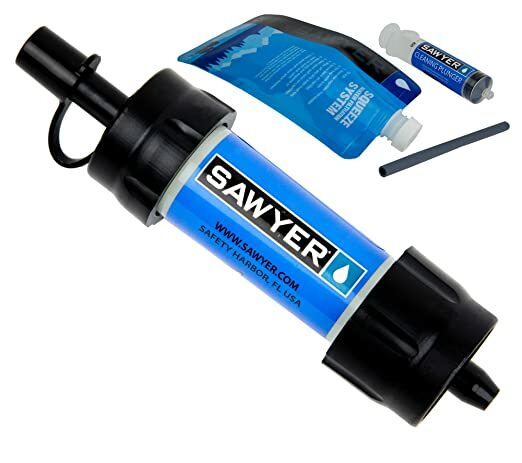 The Sawyer Products Mini Water Filtration System ensures that you can have access to drinkable water without the worry of being stricken with any of the diseases or bacteria that are commonly found in lakes, streams and rivers. The Sawyer Mini filter is perfect for everything from camping with the kids to traveling abroad where tap and bottle water cannot be trusted. This high performance filter fits in the palm of your hand, weighs 2 ounces. You can attach this filter to the included drinking pouch, to most disposable water or soda bottles, inline on a hydration pack (with no adapter required), or you can use the included straw to drink directly from your water source. It removes 99.99999% of all bacteria and 99.9999% of all protozoa, the highest testing level for filtration. It comes with a cleaning plunger (syringe) to backwash & clean the filter. You can purchase additional drinking pouches from Sawyer in 16 oz, 32 oz., or 64 oz. sizes.